Co-op store in Erickson, where they were paid for their labour with shares in the store. In 1944 they moved to Winnipeg, Man., where he helped his 'son Cliff in a garage situated in the parking lot of the Hudson's Bay Co. In 1947, William and Mary moved to Surrey, B.C. where he again helped Cliff build a house and garage in Cloverdale, B.C. William passed away in 1964 at the age of 83. Cliff married Violet (Pat) O'Brian of Ste. Rose du Lac, Man. on June 10, 1936. He was employed by the Erickson Creamery, which was managed by Dawson MacKay. He hauled five-gallon cans of cream from farms in districts such as Polonia Valley, Mountain Road, Scandinavia and Erickson. Cliff and Pat had three girls; Sharon, born in 1939; Janice in 1942; both ~orn at Mrs. Biczo's nursing home in Erickson. In 1944 Chff and his family moved to Winnipeg where he operated a garage. Judith was born in Winnipeg General Hospital in 1944. In 1947, Cliff moved his family to Cloverdale, B.C. where he operated a garage. After four years he again moved his family to Salem, Oregon, where a son, Myles, was born in 1951. He owned a garage and then went to_ work for the Forestry Service until he retired in his 62nd year. Cliff passed away on January 31, 1977, in his 64th year. Ruby McMillan married Adelard (Ed.) Lariviere of St.
Boniface, Man., on June 3, 1936. They had two daughters; Nadine, born in 1937 in-Neepawa; Audrey, born in 1938 in Minnedosa, and a SOn Wayne, born in 1941 in Mrs. Biczo's Nursing Home, Erickson. Ed. and Ruby worked the farm, when William and Mary Me­ Millan retired to Erickson, for a period of three years. They were milking fourteen cows and selling the cream in five-gallon cans for $3.50 a can. Due to the economy they were unable to hire help at harvest time. Ed. would cut the grain with the binder all day. After milking and chores and putting the kids to bed, Ed. and Ruby would go out at night and stook what he had cut all day. After shipping nineteen "Select" hogs to market in Brandon and receiving only $72. for the lot Ed. became discouraged and joined the army in 1941. Ruby and the kids moved to Erickson to await his return. Then they moved to Winnipeg where they lived for five years and in 1948 moved to Surrey, B.C., where he worked in a sawmill. Upon retiring they moved to Port Coquitlam, B.C. There was no Protestant church in the Erickson community from approximately 1918 to 1922. Church and Sunday School were held in Westmount School. They didn't have a regular minister. Mr. Mathews was serving the Protestant Indian church on. the nearby Rolling River Indian Reserve. They were fortunate to have him conduct services in the school. During this time both Cliff and Ruby were baptized by him. school childen, eagerly awaiting the happy visit from Santa. Lunch and dancing usually followed the concert. Many dances and box socials were held in the school. Small children would sleep amid blankets and coats on the double seats pushed into rows along one side of the room, while the parents danced to the music of fiddle and organ; later also accord ian and banjo. 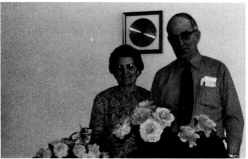 Jonas (Joe) and Mary McPhee moved from Brandon to Erickson in July, 1961 with their three children: John Joseph, Phyllis Arlene and Valerie Mae. They lived in the town until 1965, at which time they moved to a farm located 3 miles southwest of Erickson. Joe was employed with the Riding Mountain national park from 1959 to 1967, as a painter. In 1967, he was transferred to a post in the compound of the park. He was later transferred to the administration building as a pay and benefits clerk which position he held until his retirement in May of 1975. Shortly after moving to the community Joe and Mary and family worshipped at Bethel Lutheran Church at Danvers and Joe and Mary joined Erickson Lutheran Church on January 5, 1969. They were always involved in church activities and took great interest in their childrens' involvement in the church. All three children were confirmed into the church. Joe was the local scoutmaster for several years of which group John was also a member. Joe was a member of the Royal Canadian Legion, Branch No. 143 and Mary was a member of the Ladies Auxiliary of the Royal Canadian Legion, Branch No. 143. Mary was an active member of the Ladies Auxiliary of the Erickson District Hospital. Joe was instrumental in forming the Alcoholics Anonymous chapter on the Indian Reserve and was active in the group for a number of years.